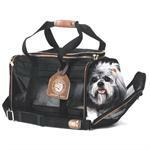 An excellent quality, well-made soft carrier for small dogs and cats that is permitted by many airlines for carry-on use. The Wheeled Comfort Carrier is the perfect go-anywhere carrier. The Cozy Time Pet Home and Carrier is a sturdy plastic crate that is excellent for smaller pets weighing less than 20 lbs. Quickly and easily assembles without tools, folds flat for storage. There's no need to leave your little pal behind—not with the Bergan Small Comfort Carrier. It looks great, wears well, and it's packed with features that make traveling with pets all the fun it should be. 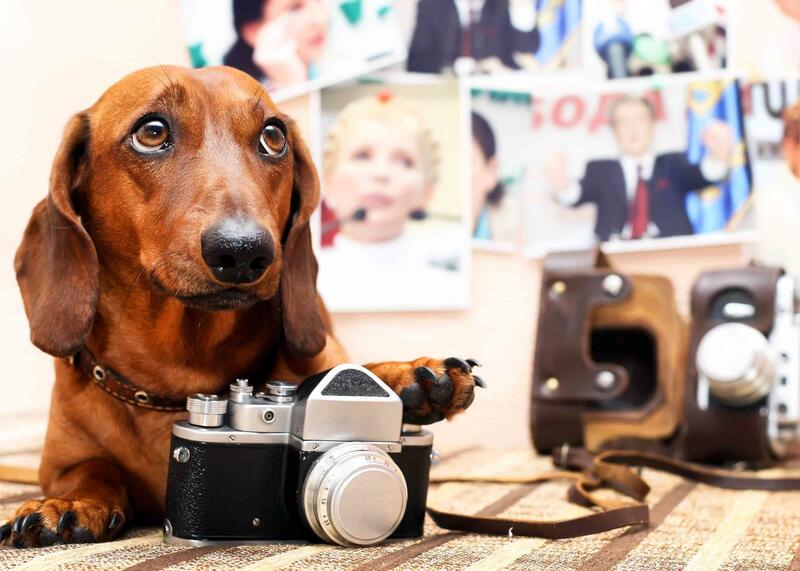 Next time you travel, your pet will be the most comfortable passenger on board! The Bergan Large Comfort Carrier is designed for maximum style, durability and function. 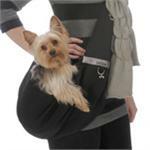 Keep your hands free and your pet secure with the Cloak & Dawggie sling. All have a soft, cozy liner for your pet and feature easy cross-shoulder construction and an inside leash tether and security clip. Sherpa's most luxurious carrier ever! The Amelia Collection carrier features a spacious, eye-catching design. Sherpa's most luxurious tote ever! The Amelia Collection Tote is the latest in an exquisite collection by Sherpa's Pet Trading Company featuring an eye-catching design. Ultimate Ventilation! The luxury and style of the Sherpa Amelia Collection Tote is now available in a convenient on-wheels design. Sherpa's Lightest Carrier Yet! 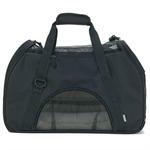 A revolutionary new pet carrier from Sherpa, the Pop Tote features a lightweight, fully collapsible design. 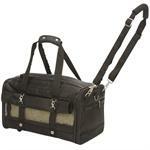 Another great designer dog carrier from industry leader PETOTE. 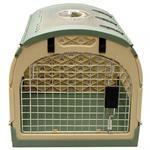 Tote your dog around in style and comfort in our newest soft-sided carrier! 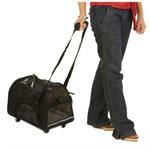 The Petote Black Rio bag is a great pet carrier on wheels for your dog or cat! In addition to being a deluxe pet carrier on wheels, the black Rio bag is also a backpack and a carseat. 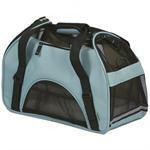 The Petote Rio bag is a great pet carrier on wheels for your dog or cat! In addition to being a deluxe pet carrier on wheels, the Rio bag is also a backpack and a carseat. Back by popular demand...PETOTE had brought back the classic Carle. 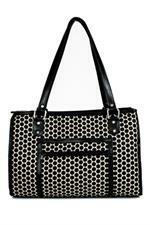 The Payton Bag is brand new from Petote! The Payton is a timeless, classic designer carrier manufactured in the USA by Petote. The Ultimate Sherpa Bag is the Sherpa Bag that has top mesh “sunroof panels” for ventilation, as well as roll-up flaps. Sherpa on Wheels, the name you know and trust for airline travel with your pets. 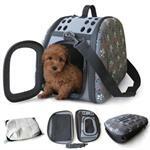 All the features of the ultimate bag for pet safety and comfort now for your comfort it has wheels. 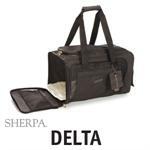 Sherpa’s Pet Trading Company® Delta Deluxe Pet Carrier is the only pet carrier to be endorsed by Delta Air Lines! 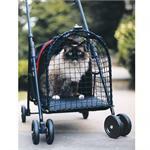 Time to go for a walk, now your cat can enjoy the great outdoors safely. The Kittywalk Sport Stroller is lightweight but strong, made from rip stop netting and waterproof fabric.